In the 40’s and 50’s, the comic book industry was riding a massive wave of popularity. DC Comics had taken off with the introduction of Superman, Batman, Wonder Woman, etc. Other companies were flourishing as well but for completely different reasons. The biggest of these companies was EC Comics or Entertaining Comics. They began a surge of horror, crime and suspense books that changed the landscape of the comic book industry forever. William Gaines took over as owner of EC Comics upon his father’s death. At the time, EC was putting out books about science, history and the Bible to churches and schools. William decided to change the direction of the company. He preferred books about horror, crime and science fiction. 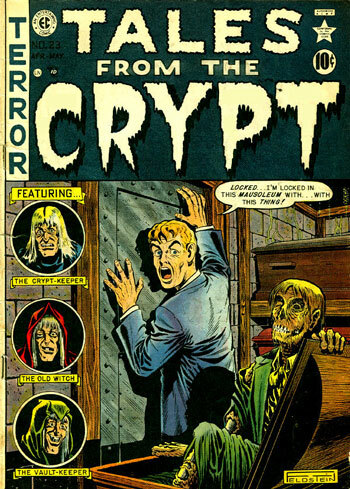 Along with editors Al Feldstein and Harvey Kurtzman, Gaines created titles including The Vault of Terror, The Haunt of Fear and Tales from the Crypt. The titles were written by Kurtzman, Feldstein and Craig but the attraction to the stories were the artists. Gaines brought in top talent and soon to be famous artists such as Johnny Craig, Graham Ingels (or “Ghastly), Frank Frazzetta and Wally Wood. With the success of these books, other companies started putting out their own horror comics. Titles like Weird Chills, Weird Tales of the Future, Ghostly Weird Stories, Web of Mystery, Horror from the Tomb, Journey Into Mystery and Strange Tales began filling comic racks all over the U.S. 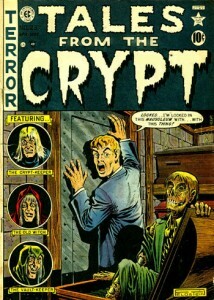 Horror and crime comics were becoming as popular as westerns and the super hero books. What would happen next would put a dagger into the heart of the horror comic industry for almost 20 years. In 1954, Dr. Fredric Werthum published a book called Seduction of the Innocent. Dr. Werthum proposed that comic books were the leading cause of juvenile delinquency, promoted homosexuality, and led to sexual deviancy. He also called Superman un-American and a fascist. The Comic Code Authority was created to police the comic book industry as a result of the public fallout from the book. Companies could no longer have images of violence and gore in the horror or crime books. The Code also prohibited the idea that policemen, government officials or anyone in a respected position could do anything that would disrespect that job (i.e. dirty cops or crooked polititans). Police officers could not die as a result of criminal activities and good would always triumph over evil. Vampires, werewolves, ghouls and zombies were banned. The words Horror and Terror could not be used in the titles of books. As a result of this onslaught, DC Comics shifted its ongoing horror titles to mystery and science fiction themes. The House of Mystery became a super hero book focusing on the adventures of J’onn J’onzz (The Martian Manhunter) and later became Dial “H” for Hero. Marvel followed suit with Strange Tales and Journey into Mystery (which saw the debut of Thor in the Marvel universe). In 1982, Wes Craven directed a live action film starring Swamp Thing. This was the opportunity for horror comics to reemerge. DC brought the character back to capitalize on the movie. The editors of the book brought in Alan Moore and gave him free reign to do whatever he wanted to the character. Moore completely changed the background of Swamp Thing. Instead of a man turned into a monster, he was the avatar of the Parlament of Trees. Moore said that the Swamp Thing was one in a long line of protectors of “The Green” (the thing that connects all plant life on Earth). Alan Moore also introduced John Constantine to the DC Universe. The character would go on to headline his own book entitled Hellblazer. Dark Horse became a major player in the horror comic genre in 1986. Dark Horse was founded by Mike Richardson and its main creators are Mike Mignola (Hellboy, B.P.R.D., Lobster Johnson and Baltimore), Frank Miller (Sin City, 300, The Dark Knight Returns and Ronin), Joss Whedon (Buffy the Vampire Slayer, Fray, Angel & the director of The Avengers), Eric Powell (The Goon & Action Comics), Rick Remender (Fear Agent, Venom and Uncanny X-Force) and Steve Niles (30 Days of Night & Criminal Macabre). This all star line up of creators brought horror comics back to the forefront of the comic industry. Not only are they putting out comics about ghost, ghouls, zombies, vampires and other creepy things, they are putting out high quality comics on a monthly basis. The advantage of Dark Horse is the creators aren’t handcuffed by a big corporation. Almost all of the titles at Dark Horse are creator owned, which means the men and women working on the titles can do whatever they want. Then in 1993, DC launched the Vertigo imprint, an adult themed line of comics. The Vertigo imprint included Swamp Thing, Hellblazer, Sandman, Deadman, House of Mystery, The Haunted Tank, Kid Eternity, Jonah Hex & Animal Man. DC utilized the same strategy as EC Comics. They brought in top level talents and combined them with up and coming stars. Neil Gaiman was on Sandman. Alan Moore was on Swamp Thing. Jamie Delano was writing Hellblazer, and Grant Morrison took over on Animal Man. These four titles were the mainstay of Vertigo and Swamp Thing, Animal Man and Hellblazer were all intertwined. In 2002, IDW decided to join the horror bandwagon and published a book called 30 Days of Night, a 12 issue series written by Steve Niles with art by Ben Templesmith. The plot centered on the small town of Barrow, Alaska where the sun does not rise for 30 days. Vampires take over during the days of darkness. The series was an instant success and even had a major film based upon it. 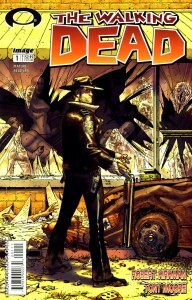 Following the success of 30 Days, Image comics released a book called The Walking Dead by Robert Kirkman and Tony Moore. Again, the book was a mega smash. The Walking Dead franchise has become massive. 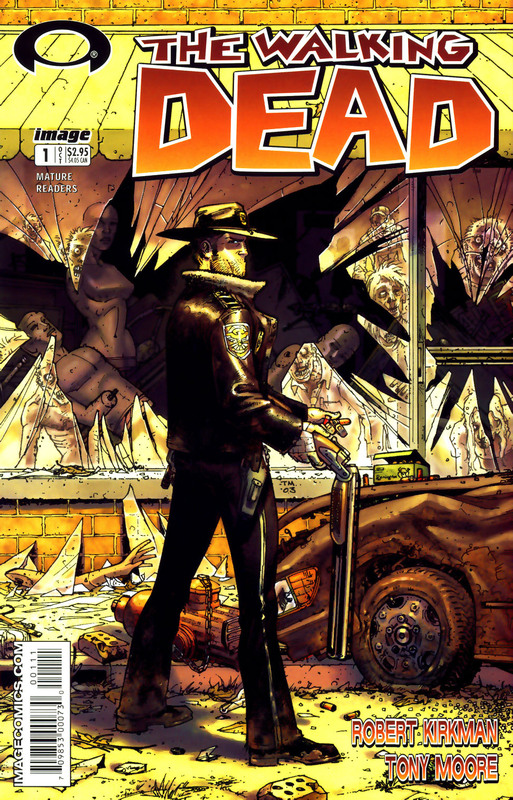 The book is closing in on 100 issues, and a third season on the AMC TV show of the same title will be out this fall. Not wanting to miss the vampire train, Vertigo began publishing American Vampire by Scott Snyder and Rafael Albuquerque in 2010. Smaller companies wanted in on the horror market, as well. Dynamite Comics began publishing Army of Darkness in 2004. Avatar Press began putting out books based on the slasher flicks of the 80’s in 2005. The titles were A Nightmare on Elm St, The Texas Chainsaw Massacre, Friday the 13th and Night of the Living Dead. These titles were so successful that DC bought the publishing rights in 2006. In 2008, Avatar began publishing Crossed by Garth Ennis and Jacen Burrows. They also put out Neonomicon by Alan Moore and Jacen Burrows in 2010. Boom Studios put out 28 Days Later in 2009 (a sequel to the Danny Boyle’s 2003 film). It will be interesting to see how the horror comic genre continues to develop. In the 50’s, Big Brother stepped in and told the publishers what they could and could not publish. I don’t think that can or will happen today, but I wouldn’t be surprised if some right wing nut job decided he or she was going to take a stand on violence in comics. I, for one, am all for horror comics done with intelligence and style. I don’t want to read a comic that is littered with violence just for the sake of violence. If you are a fan of horror, go check out Mike Mignola’s Hellboy or Joe Hill’s Lock & Key. Some of the best things I’ve read recently.